I turn 55 years old on December 29, 2009. So exercising and a good diet are no longer an option. If I am going to be a good husband, dad and grandpa; if I am going to continue having unbounding energy and enthusiasm to serve the Lord and his Church — I HAVE to do it. Jesse developed a handy-dandy chart to help us keep track our our progress. We will share it with you so you can track us too. 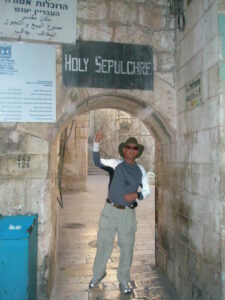 My miles will include “fun-runs” in crazy places like Israel, Turkey, Greece, Dubai, India, Italy and all over the USA. Cold weather in Michigan is somewhat problematic but we have a treadmill and an in-door tension stand for my Trek bike so we can still accumulate the miles and continue the good health. So, here is the chart and our progress so far. My son says it will automatically update every day as we add more miles. I will try to add pictures and videos as well. Wish us luck and continued good knees. 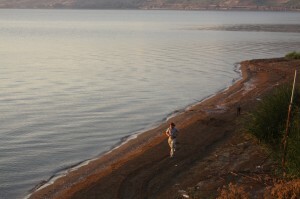 (Pictures: Steve running along shore of Galilee at sunrise; leading a group of KVSS pilgrimage runners through Jerusalem and into the Holy Sepulchre). In a series of decrees issued on December 19, the Vatican has approved miracles allowing for the canonization of five people and the beatification of five others. The Vatican also recognized the 1984 death of Father Jerzy Popieluszko as a martyrdom, preparing the way for his beatification. The decrees, approved by Pope Benedict XVI during a private audience with Cardinal Angelo Amato, prefect of the Congregation for the Causes of Saints, also proclaimed that ten other candidates for sainthood had lived lives of heroic virtue. Those decrees make the candidates eligible for beatification if a miracle is attributed to their intercession.